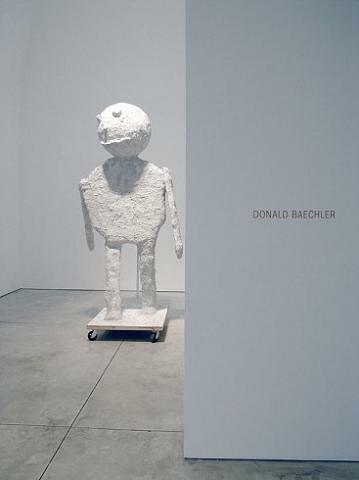 Cheim & Read is pleased to announce an exhibition of new paintings and sculpture by Donald Baechler. New York painter Donald Baechler has steadily sustained a successful career as one of the more respected artists of his generation. Born in Connecticut in 1956, Baechler studied art in both New York and Germany, and is internationally well known for distinctive large-scale paintings and collages that investigate the formal, conceptual and cultural construction of artistic representation. Thickly outlined and simple in theme, the elements of his paintings (flowers, globes, crowds, trees and ice cream cones, to name a few) are often referred to as nostalgic, though Baechler himself denies narrative intent. Instead, he seeks to find anonymity in his imagery, to produce a universal language of symbols derived from cultural ephemera. Baechler has also expanded this practice to sculpture, creating bronze forms that represent familiar motifs from his paintings and exhibit the same characteristic density of mark. Baechler's work celebrates the history of its development-erasures and rethought contours are recorded in multi-layered pentimento-and this attention to process unites a new group of paintings and one sculpture, before its casting in bronze, in Baechler's most recent show at Cheim & Read. A 2006 series of collages, exhibited for the first time, dominate the show. Baechler describes the collages as a progressive step in his working process: a middle zone, between smaller-scale drawings and large paintings, where he can work through ideas, edit imagery and build up backdrops for subsequent foreground images. The collaged elements, retrieved from a vast and actively accumulated archive of found ephemera (yellow pages, children's coloring books, catalogues, magazines, etc. ), or manufactured in Baechler's studio (by copying, drawing and interpreting), are selected, pasted and sometimes covered over, creating what Baechler refers to as a "fractured surface" which is both physically and visually intriguing. Baechler eventually paints a foreground image on to his collages, often after they have been around the studio for some time and carefully considered. Though disconnected from the collage process of the background, the painted lines of the foreground record the physical surface underneath; in this way, he references formalist aspects of painting through the material structure of his work. This focus on the construction of painting is echoed by the construction of his imagery-child-like in their simplicity and collectively identifiable, the objects he paints are distilled to sketchy essence, portrayed with a sort of everyman's rendition of the subject at hand. While referencing the untrained artist, along with children's art, art of the insane, and the drunk doodling at the bar, Baechler points out the construction of images in society and questions the structure of artistic representation. In Baechler's collage-painting, Maze, 2006, the collaged background is comprised of a telephone book's yellow pages scattered with brightly colored flowers, smiles and babies, both human and animal, in a sort of peaceful cacophony. Painted in blue on white, the foreground image-a maze contained within the profile of a man's face, like a game in a children's book-references not only labyrinthine paths of thought, but also reads as the physical structure of an actual brain. The image itself works formally and conceptually, echoing Baechler's working process as a whole.